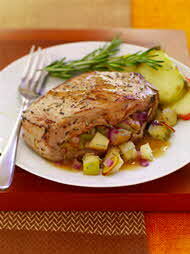 Tart apples, sweet onions and fragrant rosemary make a sophisticated and flavorful stuffing for ordinary pork chops. Serve them with sautéed kale or Swiss chard to complete the meal. HEAT 1 tablespoon of the oil in large skillet on medium heat. Add onion; cook and stir 5 minutes. Add apples; cook and stir 5 minutes longer or until slightly softened. Spoon mixture into small bowl. Add 1 tablespoon of the honey, almonds, 1 teaspoon of the rosemary, vinegar, 1/4 teaspoon of the salt and garlic powder; mix well.